I am already a HUGE cleansing oil and balm fan. I use one every single night either as my first or second cleanse. So you can imagine my excitement when a new, similar yet different texture began popping onto my radar - cleansing jellys! 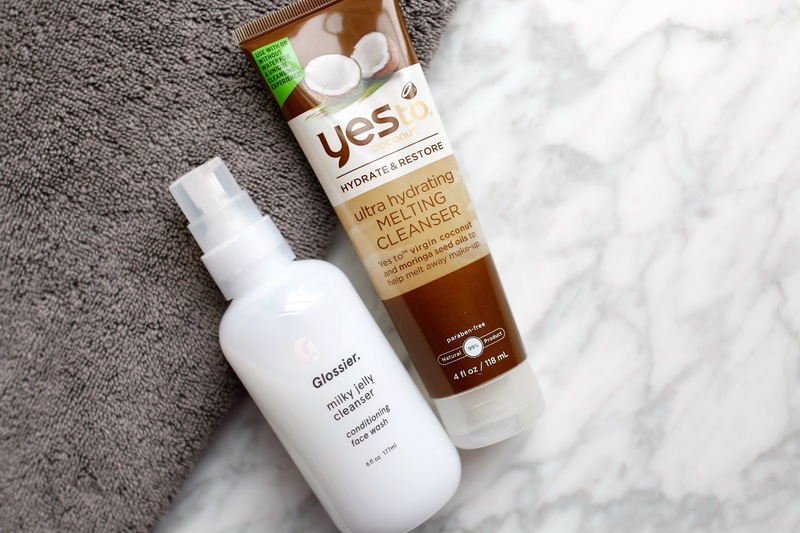 There is this one that I have used for awhile and swear by, and this one that smells incredible, so my interest was instantly piqued when these two new cleansers recently launched. Glossier's Milky Jelly Cleanser has a name alone that makes me want to put it on my face, and then Yes To Coconuts Ultra Hydrating Melting Cleanser sounds like a mini facial in a tube. 1. Glossier Milky Jelly Cleanser - I have been a fan of the Glossier range for about a year, and even included this product from them in my 'Best of Beauty 2015' video. This is the first cleanser from the line and they launched with a winner. The texture is incredibly smooth and creamy, mixing the feeling of a milk and balm into one product. I enjoy using this as my second cleanse and rubbing it in for a light massage. While I have used it as a first cleanse and to remove makeup, I found that it was able to break down most of my makeup except for certain mascaras that may be long-wearing or water resistant. Because of this, I preferred it as a second cleanse, and more recently as my morning cleanse. My skin is left hydrated and noticeably more supple, which always leads to a smoother makeup application. And a smooth makeup application ensures a better day, amiright?! 2. Yes to Coconuts Ultra Hydrating Melting Cleanser - Just like the Milky Jelly Cleanser, the name of this cleanser lured me in immediately. Hydrating and melting together in a description sounds delightful. Whereas the Glossier was more of a morning cleanser or second evening cleanse, this Yes to Coconuts cleanser has solidified a place in my evening routine as a first cleanse. It does a phenomenal job of removing makeup, while simultaneously making my skin feel incredibly soft and smooth. As with all balm and oil cleansers, I apply this with dry hands to a dry face and the first thing to stand out to me was the slight warming sensation that I felt! Not an irritating warming, but a calming warming that made my skin feel relaxed. It immediately cut through my makeup and even my stubborn eye makeup came off effortlessly. It emulsifies to a soft milk when adding water, but I do prefer to remove it with a washcloth rather than just my hands. One final bonus is that the price point is under $10 which makes it a steal! I haven't found too many drugstore cleansers that appeal to me, but this one will definitely be going on the repurchase list for sure. The Yes To one sounds amazing! I really want to give this a go! Such a great post (as always).Rarely comment but since I'd rather buy cleansers than chocolate seems appropriate. Thanks for the heads up re:Glossier Milky Jelly and we agree that the Yes to Coconuts one is really good.Of late I've been using Algenist melting cleanser.Hate the scent but the results on my sensitive,arid skin are terrific.